Sellers buy Generic Deals that have been Outsourced to the Global Crowd at Selling Prices that match their inventory. Full Selling Prices are the normally listed Selling Prices for Products and Services 'on the shelf' and available for Buyers. Products and Services are listed according to times and dates available normally up to 30 days - 6 months for long term. OutSell can be processed up to 30 days in advance of availability. Generic Deals are processed at various price ranges ready for Sellers to purchase and entice last minute enquiries. Once the Generic Deals are processed these are listed on the Sellers Trade Xchange for Sellers to purchased from. As Deals are Outsourced the full Selling Prices are locked in escrow waiting for the Buyers to purchase and release the funds. When a Buyer accepts to compete for a Deal it automatically triggers other Buyers who also want Deals for the same date. The activating Buyer can either manually Buy as the price is cascading down or can pre-set the price they want to pay. If a Buyer is unsuccessful it automatically moves to the next available Deal on the exact same date and details. The process is automatic and only requires a Buyer to set the price they're willing to pay or adjust their price for the next Deal. The Deals are processed in large quantities ready for Buyers to activate a Deal's Buying Price for it to begin to cascade down. - tracking of User activity prevents the random activation of Deals. 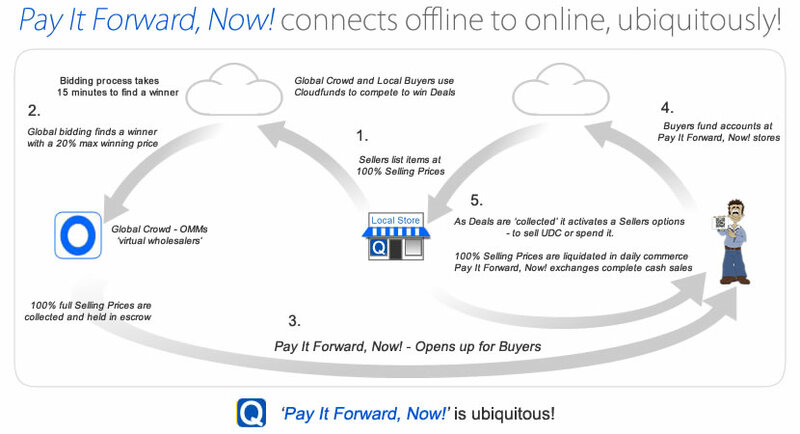 Buyers can only begin to activate Deals if they have funds in their QwickPay account. - if there's more than one Buyer with the same price, time stamp of the setting's registration determines the winning Buyer. Deals are processed 24/7 and stored for up to 30 days to allow volumes to build - sold volumes are debited from storage. In the event of any unsold Deals in the Operator's stored inventory, the processing is reversed at no cost. With Price Demand having real-time Buying Prices for Buyers to select what price suits them, it's the ultimate Seller's tool. 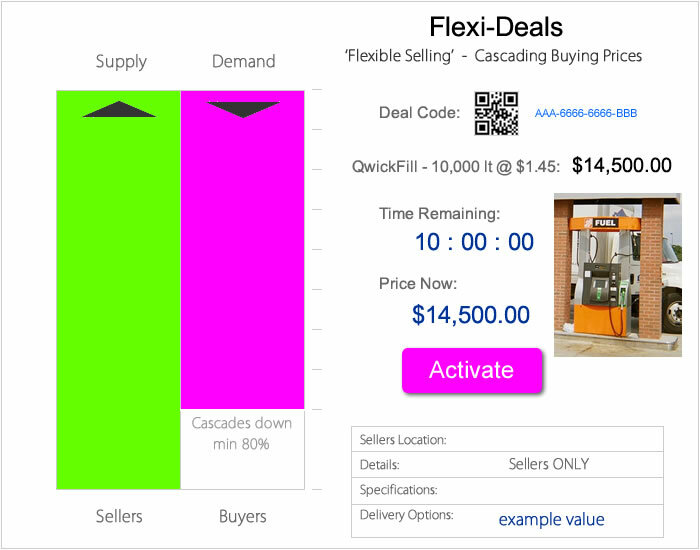 Price Demand Deals displays the Selling Prices, Buyers know the full Selling Price is what the Seller gets, allowing the bargaining to happen between Buyers, the first to click Buy Now will take the Deal. The Industries most suited to Price Demand are the Airlines, Hotels, Entertainment, Restaurants, Produce Industries like Dairy and Vegetables / Fruit, anywhere that the full Selling Price is transparent to customers but is time sensitive - cascading Buying Prices meets true real-time demand.